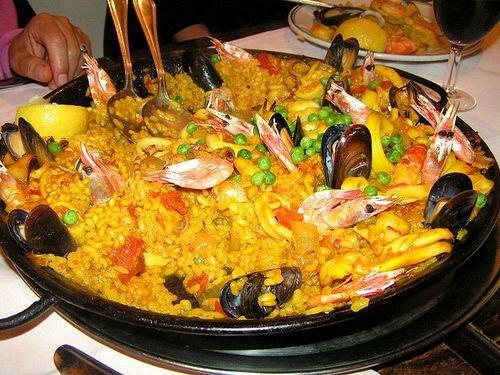 Paella is the dish associated with Spain. This combination of rice and seafood or meat and vegetables such as green peas is seen outside of Spain as the country’s national dish but is really a regional speciality from Valencia. To make a paella gather 2 tablespoons of olive oil, 1 tablespoon of paprika, 2 tablespoons of oregano, salt and black pepper, 2 pounds of skinless chicken breasts cut into small pieces, 3 cloves of garlic, 1 teaspoon crushed red pepper flakes, 2 cups uncooked short-grain rice, 1 pinch saffron, 1 bay leaf, 1 quart of chicken stock, 1 Spanish onion, 1 red bell pepper, 1 pound chorizo sausage, and 1 pound deveined shrimp. First: season chicken with olive oil, paprika, oregano, salt, and pepper. Then heat olive oil in a large skillet, add garlic, red pepper, and rice and stir for 3 minutes. Add the saffron, bay leaf, chicken stock and lemon. Lower heat and allow the mixture to simmer for about 20 minutes. In another, skillet heat oil then add chicken and onion and cook for a few minutes; add bell pepper, sausage, and shrimp, turning the shrimp until both sides are pink. Decorate paella with shrimp. Paella is best enjoyed served warm.